Last time we looked at the planets and what they represent. Now we’re going to look at what they do, starting with their relative strengths in the various signs. It’s probably going to take a couple or three articles. You will probably have read, when looking at your horoscope in your favourite publication, that various planets ‘rule’ various signs. The reason for that is that Mars, for example, has very close affinity with Aries or that the Moon’s effects pretty much match those of Cancer. The whole setup is in the table (below) which is a modernised version of Ptolemy’s Table of Essential Dignities and Debilities. Yes, that Ptolemy, all the way back in the second century AD. 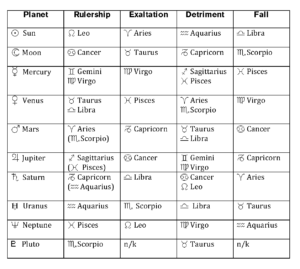 As well as the various rulerships, the table shows in which sign each planet is ‘Exalted’, in ‘Detriment’ or in its ‘Fall’. Now you’re going to need those terms explaining. Now, ‘rulership’ is fairly easy. The Sun rules Leo, for example; that’s because the Sun is the ‘king’ of the Solar system and the qualities of the Sun pretty much match those of Leo. Likewise the Moon rules Cancer—watery, nurturing and so on—and on down the list. Next thing you’ll notice about the table is that some signs appear to have two rulers and some planets rule two signs. That’s one of those occasions where the ‘old’ system (before the discovery of Uranus) has the ‘new’ planets overlaid. Originally Scorpio, Aquarius and Pisces were ruled by Mars, Saturn and Jupiter respectively. Uranus came along and was was found to be more Aquarian than Saturn (actually, pretty much anything is more Aquarian than Saturn), so it took over there; Neptune oozed in and quietly annexed Pisces; and Pluto, who just loves digging out the hidden stuff, was a dead ringer for Scorpio. The thing is, the old rulers still have an effect in some cases. There are no hard-and-fast rules here; it’s just that sometimes a Scorpio subject has more affinity with Mars than with Pluto (or maybe would like you to think so) or there are the rare, bouncy Pisces types who are a bit more Jupiter than they are Neptune. There are always other factors in an individual chart to consider but it’s worth considering the ‘traditional’ rulerships where all else fails. 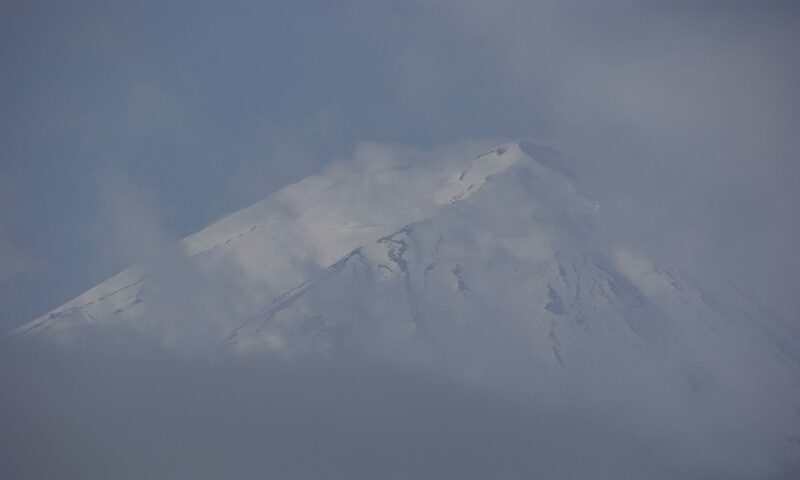 Exaltation, Detriment and Fall have somewhat fallen into disuse in modern times, at least as afar as I am aware. It’s hard enough to keep track of the original seven planets; when you add three more, at least one of which isn’t yet fully understood, it gets totally confusing. However, all I’m doing here is explaining what those terms mean. ‘Fall’ is fairly simple; it is pretty much the opposite of rulership. A planet in its Fall is seriously weakened in its effects and isn’t, basically, its usual self. Following on from that, ‘Detriment’ is a weakening of a planet, rather like running on half-power, and ‘Exaltation’ gives a planet something of a boost in its effects but not up to ‘Ruler’ level. Just in case you’re wondering why Pluto has a couple of ‘n/k’ columns, it’s because it hasn’t yet been through a complete observed cycle. When it was discovered in 1930 it was in Gemini; currently it’s in Capricorn. No matter what anyone tells you, we only ‘know’ (read: currently finalising) what Pluto does between Gemini and Sagittarius. Capricorn is a work in progress and Aquarius to Taurus are just speculation. Given that Pluto’s cycle is around a quarter of a millennium it’s going to take a while longer to get everything straight. That’s it for this one; next we’ll look at the planets themselves and what they represent. If you really want to. you can download this file. The zodiac is the backdrop of star constellations against which the Sun, Moon and planets move as seen from our viewpoint here on Earth. They are listed as follows: Aries (Ram); Taurus (Bull): Gemini (Twins); Cancer (Crab); Leo (Lion); Virgo (Virgin); Libra (Scales); Scorpio (Scorpion); Sagittarius (Centaur); Capricorn (Sea Goat); Aquarius (Water Bearer); Pisces (Fish). Each sign has a (notional) 30 degree piece of the sky which conveniently adds up to a full 360 degree circle. They are the constellations which lie on the plane of the ecliptic along which the Lights and planets move in their annual dance across the heavens. Please note that there are twelve (12) signs. No more, no less, despite what sceptics like Dara O’Briain, Prof. Brian Cox or NASA might tell you. It’s been twelve signs since the system got started and it will remain that way. 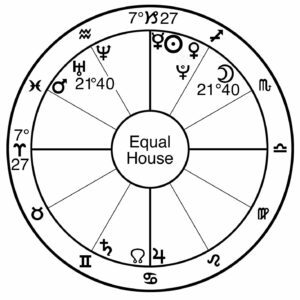 Yes, astrologers know perfectly well that, because of the phenomenon of precession of the equinoxes caused by an endearing little wobble as the Earth rotates about its axis, the zodiacal constellations don’t line up like what they used to. This means that March 21st or so is when the Sun, by observation, moves into Pisces rather than Aries. But there’s a really good reason why that doesn’t matter. It’s because the astrological signs don’t actually mean anything. Just like the months on a calendar, the astrological ‘signs’ are convenient ways of marking the passage of the Sun around the Earth. For social and commercial purposes the world standard is the Gregorian calendar which is the one you have hanging on your wall. But there are other calendars in daily use everywhere in the world which have uses for religious observances, local feasts and the like. So Midsummer Day (for the northern hemisphere, anyway) next year falls on June 24th (Gregorian), 11th of Tamuz, 5778 (Jewish), Ding Si day, Ji Wei month, Wu Xu year (Chinese) or, astrologically, 3rd of Cancer. However you measure it, though, it’s still Midsummer Day. When this astrology thing all started to get organised, it was observed that those born in the thirty-day period following the Spring Equinox tended to have the qualities associated with the local variation of ram. Those born in the following thirty-day period tended to have the qualities of a bull, and so on through the year. That pretty much followed the positions of the corresponding constellations in the zodiac and, given that very few people could read or write, it meant that astrologers could at least tie the days to a system which was illustrated in the sky, along with any necessary explanatory stories to get the point across. Precession of the equinoxes means that the astrological markers (signs of the zodiac) no longer line up with the observed astronomical ingresses (Technical Term #4). That’s not a problem. In the same way that November is no longer the ninth month of the Gregorian calendar (from the latin novem, nine) but still retains its name, so Aries is still the first ‘month’ of the astrological ‘calendar’. It’s also still the point at which Ariens are born instead of Pisceans. So let’s have a look at the attributes, for and against, each sign of the zodiac. The symbol next to each name is its ‘glyph’ (Technical Term #5), a sort of astrological shorthand. x Aries: Short attention span, great starters but poor finishers, enthusiastic, impulsive, brave but also reckless, selfish, thoughtless, impatient. Quick to anger but over just as quickly. c Taurus: Practical, patient, strong-willed, loves food, luxury and also other sensual pleasures, trustworthy. The downside of that, of course, is that they can be stubborn, greedy and possessive. And very, very lazy. v Gemini: Versatile, communicative, witty, lively, rational. Restless, changeable, flippant, inconsistent, superficial. b Cancer: Sensitive, sympathetic, imaginative, protective, nurturing, kind, cautious. On the other hand; self-pitying, touchy, unforgiving. A tough exterior can hide a weak character. n Leo: Generous, dramatic, enthusiastic, creative, broadminded. Also pompous, conceited, dogmatic, snobbish and possibly tyrannical. m Virgo: Analytical, tidy, modest, hard working. Sounds good, doesn’t it? Health conscious bordering on hypochondria, fussy, hypercritical, pedantic. There’s always a downside. X Libra: Harmonious, balanced, refined, fair, charming, diplomatic. indecisive, resentful, changeable, flirtatious, gullible. C Scorpio: Passionate, secretive, trustworthy, intense, determined. Jealous, scheming, secretive, suspicious. Don’t cross a Scorpio; you’ll be looking over your shoulder until they get their revenge. V Sagittarius: Joyful, freedom-loving, sincere, frank, philosophical. Careless, capricious, irresponsible, prone to exaggeration and with a tendency to open his mouth only in order to change feet. B Capricorn: Determined, reliable, cautious, disciplined, traditionalist. Mean, rigid, pessimistic, a wet blanket. N Aquarius: Independent, friendly, progressive, original, loyal. Eccentric, unpredictable, contrary and yet with fixed opinions. M Pisces: Compassionate, sympathetic, intuitive, kind, humble, emotional. Vague, disordered, weak-willed, indecisive. That is by no means an exhaustive run-down of the twelve signs but it will do to be going on with. I think it might be a good time to do a series of posticles (posted articles, anyone?) giving some basic pointers to what goes into astrology. So, to use American terminology, welcome to Astrology 101. 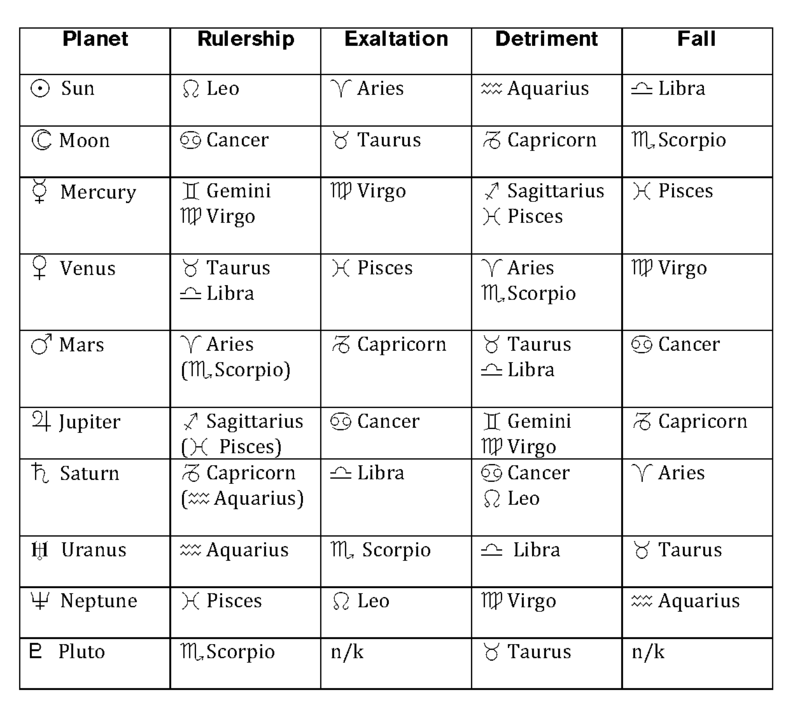 To do astrology, the first thing you need is the chart. That’s the circular picture with a bunch of strange symbols, apparently random numbers and some lines connecting various of the strange symbols with one another. It may be called the birth chart, the native chart or the radical chart but it’s the starting point for astrological interpretation—and for budding astrologers. I’m not going to go into how the chart is calculated. While there were computers which could do the job when I started, it was almost quicker to calculate the thing by hand anyway. Besides, given that the storage medium was the good ol’ floppy disk and computers were neither ubiquitous nor reliable, it was a Good Thing to be able to erect (Technical Term #1) a chart by hand. You just had to be good at sums. So let’s look at it from the point of view of interpretation. Think of it as a cake with a number of ingredients, all of which are essential to the recipe and each of which has an effect on most, if not all of the others. The seasoned astrologer will be able to look at the chart as a whole and get a picture in his/her/its mind of the overall person, event or whatever entity is being studied and will then start muttering things like, ‘Oh, that’s interesting’ or ‘Hmm, don’t like that’ and if the Native (Technical Term #2) or person-for-whom-the-chart-is-being-read is within earshot, that’s when they start looking for the exit, generally getting nervous or possibly start thinking about making a will. 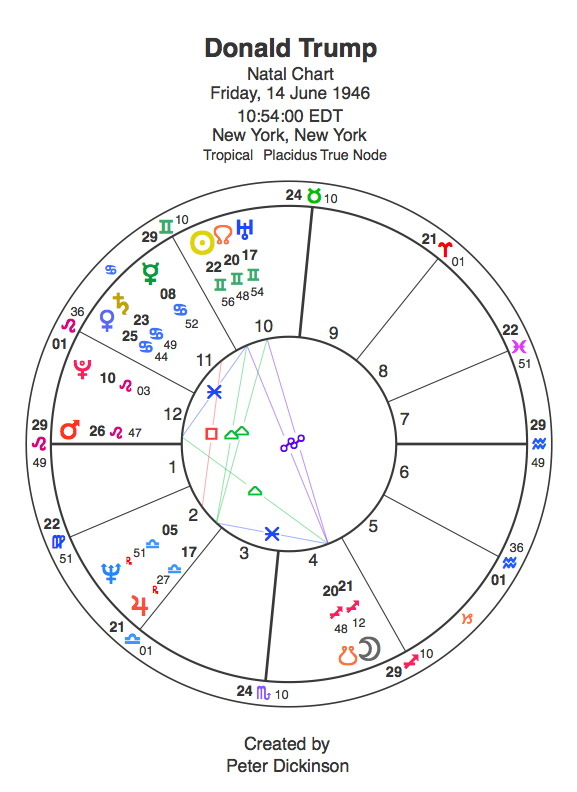 By the way, if an astrologer says something like, ‘What’s a nice little planet like you doing in a chart like this,’ leave immediately by the nearest exit and then start running. Fast. So the starting point for this recipe is the ingredients. 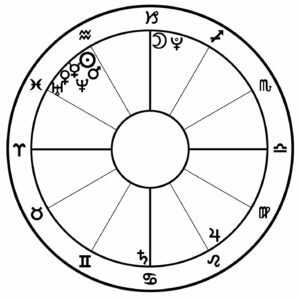 What you need are; twelve signs, two Lights (Technical Term #3, meaning the Sun and the Moon) and eight planets, twelve Houses, four angles and a minimum of five types of Aspects. The beginner will look at each ingredient individually—planet in sign, planet in House, aspect from one planet to another—and build a picture from that. A more practiced and experienced astrologer learns to look at those things all at once and synthesise the various (and possibly conflicting) bits and pieces into one part of the whole picture that will indicate the personality of the Native when the process of interpretation is complete. Right. That will do for now. Next posticle we’ll look at the zodiac in all its twinkly glory. The astrological signs come in four flavours (Fire, Air, Water, Earth, also known as the Quadruplicities) and three characters (Cardinal, Fixed, Mutable aka the Triplicities). Okay, so what does that mean? Let’s take the flavours first. Any given party is very likely to have a mix of the various signs so we’ll use that as an analogy. So, Fire signs (Aries, Leo, Sagittarius) are generally outgoing, extrovert, generous, cheerful and possibly a bit loud. There’s a tendency towards tactlessness but they are usually fortunate enough to get themselves out of all but the most horrific of messes. Water signs (Cancer, Scorpio, Pisces) are the feelers of the zodiac. If you see someone tearing up at the mere suggestion of something sad—or happy, for that matter—chances are that there’s Water in that person’s chart and quite probably near the surface—Sun, Moon or Ascendant. Earth signs (Taurus, Virgo, Capricorn) are mainly practical types. They will quietly beaver away at whatever it is they do and get the job done. At our hypothetical party they will be the ones who take their empty glass back to the kitchen for a refill, rather than just parking it in a place convenient for getting knocked over (smashing optional) and will gather up what they can see and/or carry on the way. They tend to be a bit earnest (Virgo, I’m looking at you) and appear to be rather slow. The characters (Quadruplicities) can be looked at by using an analogy of the four seasons. Cardinal signs kick things off, get them started, give the initial push; think March (Spring, Aries) June (Summer, Cancer) September (Autumn/Fall, Libra) and December (Winter, Capricorn). Fixed signs take that push and maintain whatever has been started; April, Taurus; July, Leo; October, Scorpio; January, Aquarius. 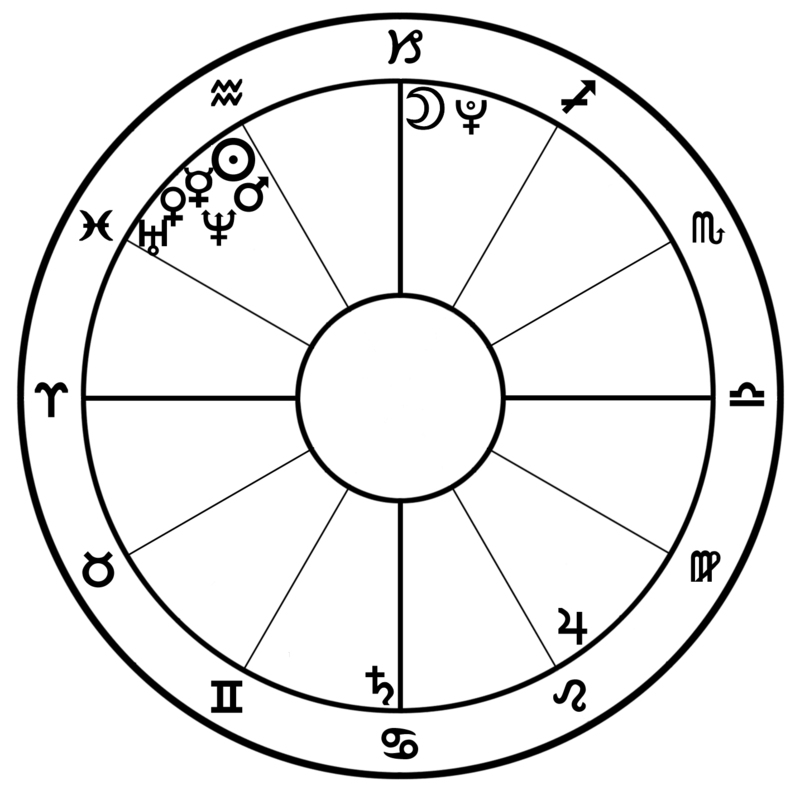 Mutable signs are responsible for winding up the old impetus/season, making it all nice and tidy in preparation for the next one; May, Gemini; August, Virgo; November, Sagittarius; February, Pisces. … which is exactly what may happen on Monday (Aug 28th) when the Moon is Void of Course from 10.39am until 8.49pm (both times BST)—in other words, pretty much the whole working day. There’s a couple of doozies in September, too. Mundane and/or horary astrologers—and those with even a passing interest in same—will have read the term, ‘Void of Course Moon’ and its interpretation, ‘nothing will come of the matter’. To others it may just be an esoteric term to be glossed over. Well, not any more! The Moon is said to be Void of Course when it has no further major aspects to be made before it leaves a particular sign. Major aspects are conjunctions, oppositions, squares, trines and sextiles. This state of affairs can last from a few seconds up to two and a half days—the approximate time it takes for the Moon to travel completely through one sign. It sounds a bit complicated but it’s actually quite easy once you’ve got your head round it. Let’s look at a couple of examples. The Moon is ‘Void of Course’ from this point until it enters Sagittarius 14 hours and 42 minutes later. The Moon is in Scorpio and is square to Uranus over in Aquarius (Figure 1, above). It is at exactly the point of the square—from here the two bodies are separating. Also, from here the Moon is Void of Course because it doesn’t make a major aspect to anything until it enters Sagittarius where, apart from anything else, it has a whole raft of conjunctions in store. On this particular occasion—it’s a real-world example—the Moon’s VoC period was 14 hours and 42 minutes. The next VoC period—after a conjunction of the Moon with Mercury in Capricorn—was just an hour and 24 minutes. The two and a half day stretch doesn’t happen often. That occurs when most of the rest of the Zodiacal planets are all in one or two places. Let’s have another look. Once the Moon’s opposition to Saturn passes exactitude, the Moon is Void of Course until it enters Capricorn and all the way until its’ Aquarius ingress. in Taurus and Pluto in Sagittarius. So, the Moon’s last aspect is to Saturn at the back end of Sagittarius, at which point it goes Void of Course. It gets into Capricorn a little later—and is Void of Course again immediately because there are no major aspects to be made until it enters Aquarius a couple of days and a bit further on. So that’s the technical bit over and done with. But what does a Void of Course mean astrologically? It’s a period when one should do ongoing stuff and get shot of unfinished business. Clearing out, finishing off and planning what to do next is also good. But don’t start any projects, don’t initiate any new schemes. Either they won’t get off the ground at all or they will start and then fizzle out. It’s sort of similar to retrograde Mercury but much shorter and a bit more general. Ever wonder why that guy you met at the bar/pub/club seemed so promising at the start but any sign of attraction had gone the next day? It has to be said that some blokes should be left in dark places but that’s by the bye; the chances are that the Moon was Void of Course that night and it just wouldn’t work out. Or the time when everyone in the office really got behind a new idea and pushed—and it still bombed? Either the idea wasn’t as good as it looked or you all got going when the Moon was Void of Course. One other situation which is specific, I think, for writers, artists, musicians and any other creative types. You may find that doing anything at all is difficult during such a period and I have a theory. Because painting, composing, writing or even throwing a pot is continuous creation, rather than just starting a project and then letting it roll, you may find yourself short of inspiration or unable to settle to a job. I used to wonder why it was that I could stare at a blank piece of paper (nowadays it’s a screen) and get nothing all day—and then be writing furiously from 10pm onwards. Now I’d put it down to a Void of Course Moon period. That’s apart from those infuriating times when brain-fade is the culprit—or ideas just stay away in droves! Just in case you’re wondering, one may edit and correct ‘til the cows come home. That’s not creative. Come In, No. 45, Your Time Is Up. On August 21 2017 there was a Solar Eclipse visible through much of the USA which peaked at 18.26 (6.26pm) GMT. That’s 7.26pm British Summer Time, and variations in the USA on 2.26pm Eastern, 1.26pm Central, 12.26pm Mountain and 11.26am Pacific time. The variations depended on where you (in America) are and whether or not your local State, County or other public body recognises Daylight Saving Time. Like Arizona doesn’t. There was also the New Moon in Leo at 18.31 (6.31pm) GMT. I’m sure you can work out when it occurred for your position given the information above. Add one hour for BST, subtract four hours for EST, five for Central and so on. Just to round things off, the Moon was then Void of Course from 18.31 GMT until 20.26 (8.26pm) GMT when it entered Virgo. That’s plus one hour for BST… oh hang it, you know what to do. A Void of Course Moon is potentially a bit of a nuisance because you may want to start something, like a project or job that needs doing, based on ‘new moon, new start’. Well, don’t. However, VoC Moons is another article. Now, please don’t run away with the idea that the eclipse has any extra-special significance just because you were underneath it. Yes, eclipses are special but essentially a Solar eclipse is a New Moon with attitude. The old order may change—somewhat—but not right now. It’s the start of a process rather than the culmination of one. I’m not going to go through stuff for the whole world because if I did you’d still be reading this next month. So I’ll start with the UK. UK: To Brexit Or Not To Brexit? The first thing to note is the constellation in 7th House comprising the Sun, Moon, Mars and the North Node in Leo with retrograde Mercury in Virgo. All except Mercury are making a trine aspect to retrograde Saturn in Sagittarius in the 10th House. 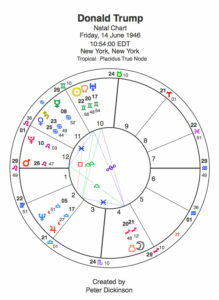 The third item to note is the T-square of Venus in Cancer (6th House) to Pluto in Capricorn (12th House) all square to Jupiter in Libra (8th House). Of further interest (to me, anyway, but then I’m pedantic) is that those House positions correspond very closely with those in the UK 1801 chart which is what I’m using for comparison. 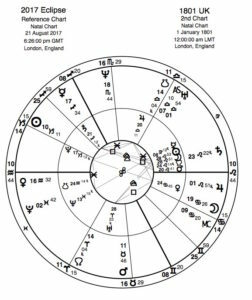 There’s also Uranus in Aries in the UK’s 2nd House which is exactly trine to the eclipse. So, what does it mean for the UK? All that going on in the 7th House means that partnerships of all sorts are going to come in for really, really intense scrutiny. Well, yes, that’s happening anyway with Brexit, I hear you say. Yes. But. My impression from this chart is that there will be a change in focus, quietly and in the background, from how to get the UK out of Europe to how to keep it in. Of course, that means that there will be a lot of shouting from those ‘out’ voters who haven’t actually changed their minds yet. ‘Because there is an indication in the Eclipse chart that such a thing is rather more than a possibility. The Venus-Pluto-Jupiter T-square is another indicator of change but as much a change of heart than anything necessarily visible; this gives me to think that a sort of non-Brexit Brexit is very much on the cards, if not actually a volte-face by everybody (except the die-hards) which sees the UK essentially remaining in the EU. The change of heart is in the Venus-Pluto opposition axis with whatever damage-limitation necessary indicated by Jupiter in Libra in the 8th House, itself a further indicator of change. 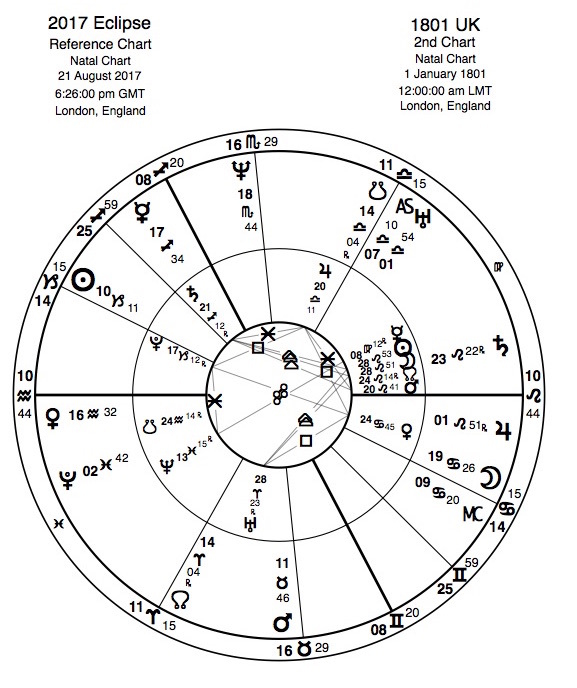 The Uranus factor is usually revelationary, revolutionary, unexpected or downright weird; in this case, its 2nd House placement may reveal unexpected costs (or possible benefits) for both pro and con Brexit but, either way, it’s very likely to throw a financial spanner in the works somewhere. None of that will be easy; there will be a lot of shouting about ‘democracy’ and ‘the will of the people’ and it all may lead to the second referendum which everyone wants to avoid. We shall see. The eclipse constellation of Mars-N. Node-Moon-Sun in Leo with Mercury in Virgo is stuffed into the USA’s 9th House. That’s point one. 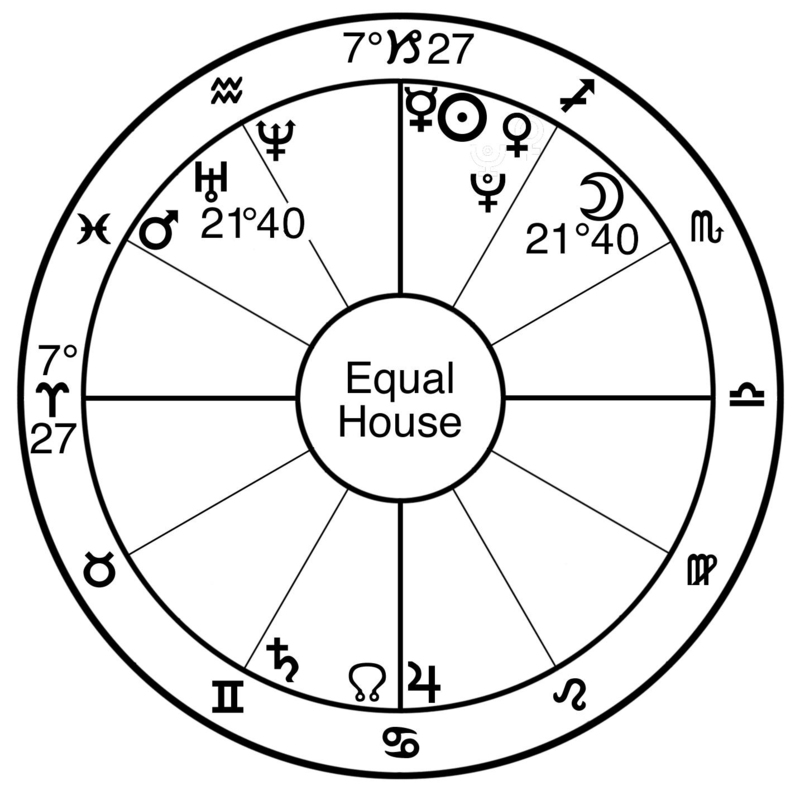 The Venus-Pluto-Jupiter T-square is, respectively, 8th-2nd-11th Houses. That’s point two. The eclipse takes place in exact opposition to the USA’s Natal Moon and the eclipse Venus is in exact conjunction with the Natal retrograde Mercury. That’s point three. Point four is Saturn in Sagittarius in the Natal 1st House with its trine aspects to Mars, North Node, Sun and Moon. Then there’s another little thing. Uranus in Aries in the Natal 5th House is exactly trine the eclipse. Let’s call that point five. Short version; some kind of revolution. The 9th House is about long-distance communication, philosophy and justice. A Solar eclipse in there would indicate change or changes in the Justice system; with a Mars conjunction involved the impetus for change is ramped up; with the eclipse in exact opposition to the Natal Moon in Aquarius (the revolutionary) in the 3rd House the American people, or a significant proportion thereof, is going to have a hissy-fit of monumental proportions and pretty much insist that Justice Must Be Done. Add Uranus in Aries into that and a creative (5th House) means of doing so will be found, right the hell now. For what, and in which field, remains to be seen as this chart is essentially for the USA as the Federal entity, rather than as the several States, and so there is the potential for some local injustice coming to the fore as well as whatever is going on in Washington DC. But it’s DC for which I have set the chart so that’s what I’m looking at. The thing is, this chart could topple a king. Eclipse chart (August 21 2017, 6.26 GMT, located Washington DC) compared to chart for Donald Trump (June 14 1946, 10.54am EDT, New York, New York). 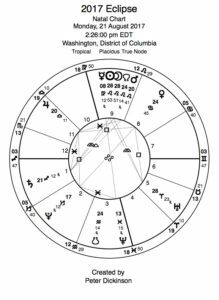 The current incumbent of the Oval Office at 1600 Pennsylvania Avenue has Sun in Gemini and Moon in Sagittarius. What you see on the news and in person, however, is the Leo Ascendant. Leo Ascendant can look like a king; can sound like a king; really, really wants to be a king. But it can’t act like a king, can’t speak like a king and ain’t never gonna be no king. (I have Leo rising—I speak from experience. Add in my Taurus Sun and I can’t be arsed anyway). As one American phrase puts it, No. 45 is all hat and no cattle. Sun in Gemini is the speaker who can sway a crowd, but only with slogans, and charm the birds from the trees, but only temporarily. Moon in Sagittarius is capable of proper oratory but Mr. President’s Gemini Sun gets in the way of that with the quick fix (Twitter) rather than the slow burn (government). That Moon position is exactly what’s behind the ‘proclamation by Tweet’ that happens now and again—the Sagittarian propensity for saying the first thing that comes to mind and (usually) ending up with a case of foot in mouth. Trouble is that Sagittarius can also get away with it; but only up to a point. 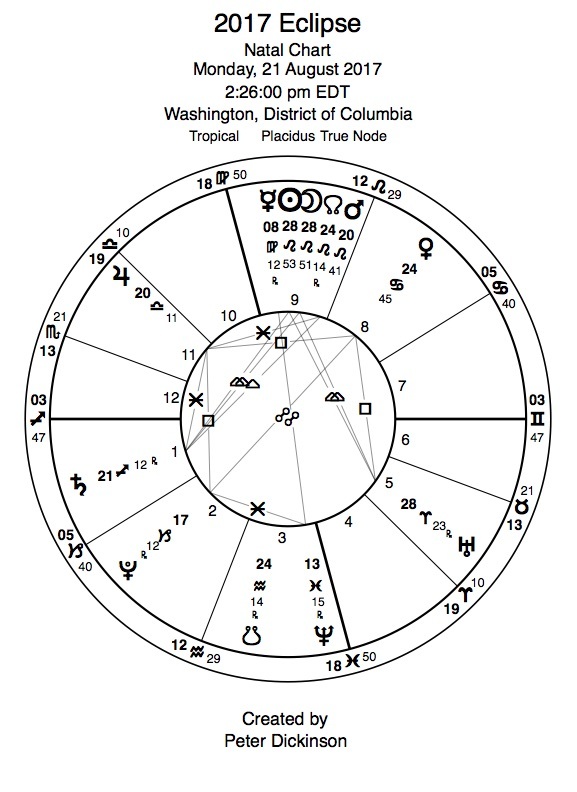 So the eclipse versus Donald Trump stacks up this way: the eclipsed Sun-Moon conjunction is right on DT’s Ascendant and very close to his Natal Mars; the Pluto-Venus-Jupiter T-square affects his Natal Saturn-Venus conjunction in his 11th House and his 2nd House Jupiter in Libra; Saturn in Sagittarius is exactly (and I mean right on the nose) conjunct his natal Moon; and Uranus in Aries in in Trump’s 9th House. Without going into too much detail, as you may be getting bored by now, this could go one of three ways. One is with a gunshot but I don’t think so; the effect of the eclipse on the Federal chart will be that Justice must be seen to be done and an assassination would simply dissipate that into searching for the assassin. Second up is that Mr. Trump is persuaded, by family, friends, business associates or whoever, that he either has to change or resign. Somehow I really don’t see that happening. But the effect of the eclipse on his Ascendant and Mars is to put out the kingly fire somehow; and the 12th House, among other things, is known as ‘the House of self-undoing’. It’s also associated with mental health. Top of my list are two things; a stroke of sufficient severity to render him permanently incapable of holding office (change imposed from without) or a mental breakdown with the same effect (change from within). And if things do start to change that way Mr. Pence is going to start thinking that he’s sitting in the catbird seat. Probably not a good idea. None of this is likely to happen right now. An eclipse, like any other New Moon, sets the scene for what is to come later, usually over the next six to twelve months, so don’t expect radical change just yet. But do expect change, especially in the Justice system and possibly in the political system, including but not limited to an Amendment which makes getting elected an entirely different prospect. You can also expect a change in both the House and the Senate with next year’s mid-term elections. We will watch with interest. Great interest. So, there are four elements; Fire, Air, Water and Earth. Fire types are impulsive, friendly and generous—and have a bit of a temper. Air signs are the intellectuals who think their way through situations and don’t appear to have much in the way of emotions. You’ll recognise your type somewhere in here but don’t get the idea that you are looking at your Sun sign. Most of us use our Moons and/or Ascendants most of the time so if you find that you’re the weepy type then it’s a fairly safe bet that you have a Water Moon—Cancer or Pisces being the most likely! You are generally the warm and friendly type, as noted above. In your own ways you tend to be very impulsive; Aries will rush headlong into whatever has piqued her interest, get halfway through and leave it unfinished having discovered a new game to play. Leo is impulsively generous with time and/or money and is likely to throw a party at the drop of a hat. Mind you, that’s so that everyone will know what a wonderful person he is! Not backward in coming forward, Leo! Sagittarius is a traveller and seeker of knowledge and thinks nothing of disappearing to the other side of the world in search of some obscure information to help the latest quest. Fire types are also passionate; the latest is always the greatest and they’ll love you for ever (or until the next one comes along). That passion also translates into a fiery temper which can be as spectacular as it is short-lived. You are the intellectual sort, always on the lookout for information. You’ve all got slightly different ways of using that information, though; Gemini will take it in and then push it out again, rather like a news bulletin on the TV. Libra does essentially the same thing but it’s more like gossip. Libra likes to make things prettier so that sign sort of fancifies things a bit. Neither sign can keep a secret, either. Aquarius uses any information gathered for the benefit of all mankind—but she has her own definition of ‘benefit’ which doesn’t necessarily match anyone else’s. If you like thinking, word games and academic discussion you’ll like the Airy types. You people are all about feelings—and quite a lot about tears! You cry when you’re happy, sad, at weddings, funerals, bar Mitzvahs, baptisms, fireworks displays and an awful lot of movies! You are all comforting, though, in your own ways; Cancer will do ‘Mum’ and make tea and sandwiches, Pisces will empathise (and cry) with you and help you to get over things, Scorpio will plan a good way to get your own back—even if that’s not really the point! Unless you happen to be one yourself, you may not find Earth signs terribly interesting. They are not the quickest of beings, either. That doesn’t mean to say that they are dim—far from it—but they don’t believe in doing things quickly, they prefer to do them properly. Taurus takes his time to make things work right and look nice. Virgo takes her time so that the details are correct (to the point, sometimes, that she forgets the overall plan) while Capricorn is concerned that not only should the job be done correctly, it should be seen to be done correctly. Rather a stickler for the rules, Capricorn—but capable of bending or breaking them if the situation demands it. You are all basically practical people. If you say you’ll do something, it will get done. Reliable and dependable. When faced with a situation you don’t go into a tantrum, emote all over it or talk it to death. You just get it fixed. Not terribly interesting, no. But the world can’t do without you!